Fred Hampton, deputy chairman of the Illinois chapter of the Black Panther Party, was born on August 30, 1948 and raised in the Chicago suburb of Maywood, Illinois. In high school he excelled in academics and athletics. After Hampton graduated from high school, he enrolled in a prelaw program at Triton Junior College in River Grove, Illinois. Hampton also became involved in the civil rights movement, joining his local branch of the National Association for the Advancement of Colored People (NAACP). His dynamic leadership and organizational skills in the branch enabled him to rise to the position of Youth Council President. There Hampton mobilized a racially integrated group of five hundred young people who successfully lobbied city officials to create better academic services and recreational facilities for African American children. In 1968, Hampton joined the Black Panther Party (BPP), headquartered in Oakland, California. Using his NAACP experience, he soon headed the Chicago chapter. During his brief BPP tenure, Hampton formed a “Rainbow Coalition” which included Students for a Democratic Society, the Blackstone Rangers, a street gang and the National Young Lords, a Puerto Rican organization. Hampton was also successful in negotiating a gang truce on local television. In an effort to neutralize the Chicago BPP, the Federal Bureau of Investigation (FBI) and the Chicago Police Department placed the chapter under heavy surveillance and conducted several harassment campaigns. In 1969, several BPP members and police officers were either injured or killed in shootouts and over one hundred local members of the BPP were arrested. During an early morning police raid of the BPP headquarters at 2337 W. Monroe Street on December 4, 1969, twelve officers opened fire, killing the 21 year old Hampton and Peoria, Illinois Panther leader Mark Clark. Police also seriously wounded four other Panther members. Many in the Chicago African American community were outraged over the raid and what they saw as the unnecessary deaths of Hampton and Clark. Over 5,000 people attended Hampton’s funeral where Reverends Ralph Abernathy and Jesse Jackson of the Southern Christian Leadership Conference eulogized the slain activist. Years later, law enforcement officials admitted wrongdoing in the killing of Hampton and Clark. 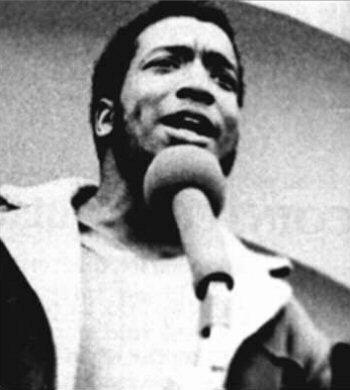 In 1990 and later in 2004 the Chicago City Council passed resolutions commemorating December 4 as Fred Hampton Day. Peniel E. Joseph, Waiting ’Til the Midnight Hour: A Narrative History of Black Power in America (New York: Henry Holt and Company, 2006); Huey P. Newton, War against the Panthers: A Study of Repression in America (New York: Harlem River Press, 1996); John Kifner, “Police in Chicago Slay 2 Panthers,” New York Times, December 5, 1969; John Kifner, “Panthers Say an Autopsy Shows Party Official was Murdered,” New York Times, December 7, 1969. New York Times, December 7, 1969.